Yes, even more leaked Space Marine images. This time the all important Tactical Squad. Rejoice wargamers because it looks like they’ll be a squad of 10 after all but goodness knows how much they’ll be. They look like they’ve just been tidied up rather than anything too mental done with them, which is good. In fact it looks like there’s just been sharpening of detail and improving some of the poses. I heard a rumour that they’ll be some bits to make pre-heresy armour variants but we’ll see. And here’s some snaps of the new Sternguard models as well. Which look awesome. And thankfully in keeping enough with the previous Veteran models that I won’t need to replace them. Hurrah! Like Phil, I’m very glad that the box will still have ten models, I honestly wasn’t expecting that though it does remain to see how much GW will charge. Hopefully some of the crazier rumours we’ve heard about this box set (all heavy weapons, heresy armour) will pan out also. Nevertheless, I really like the look of this set as it will both give me extra options for my Chaos Marines as well as allowing me to press ahead with my long-gestating Imperial Fists project. 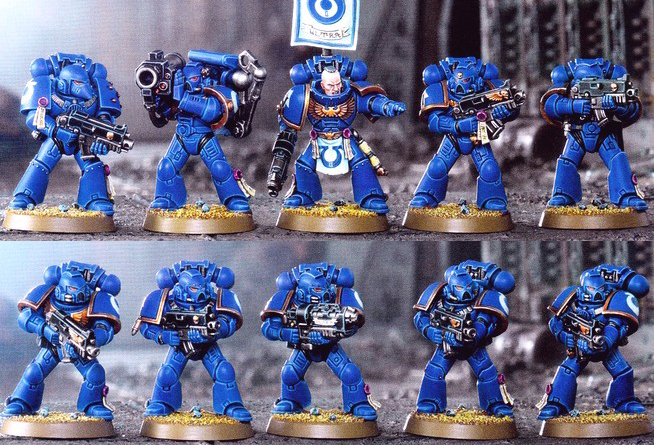 Heck, I might even paint up a squad of Ultramarines. Fourth Company, of course! I’m skeptical about the heavy weapons and heresy armor. This box appears to give us the new special weapon and legs that make the marines squat less. If the price really is the rumored $40USD for ten, I’ll be pleasantly surprised. If they really wanted to make me happy, they’d include CCW arms, but I won’t hold my breath for that one.